Made from the highest quality shatter-resistant acrylic. 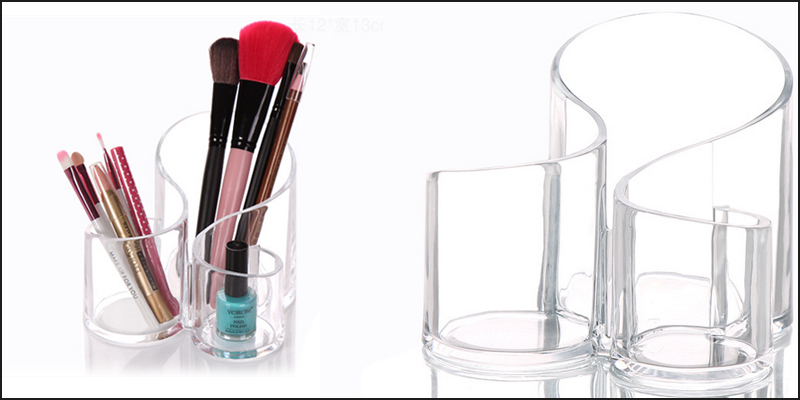 Organize all of your daily makeup basics in one place with this crystal-clear organizer. Everything is easy to see through the clear case and within easy reach, avoid the boring hunt. Replace the fragile glass to avoid hazardous. Perfect to keep your lip stick, lip gel, nail polish, makeup brushes, cheek colour, liner pencils, foundation stick, beauty gadgets and jewellery etc. Displays skillfully anywhere and keeps things at your fingertips. Beautiful shape, smooth and modern design. Great for makeup, accessory and short-handed makeup brushes. Beautiful way to display your brushes on your dresser. A good gift for female friends.